“I don’t think you fully understand the public, my friend; in this country, when something is out of order, then the quickest way to get it fixed is the best way” – Ken Kesey; One Flew Over the Cuckoo’s Nest. We live in a similar society represented by the quote above. It is this society that dictates norms and urges conformity, while those individuals who reject societal views and pressures are the ones deemed insane. It is the society, the system that determines what is right and what is wrong. The system very cleverly suppresses the voices, even the right ones if they seem to challenge its authority. How often have you heard phrase like ‘It’s outside the system’, ‘its unconstitutional’ ‘She is being so impractical, so random’. And what is sad is that we ourselves fall in the ‘Its-wrong-because-its-outside-the-system-trap’. Such is the impact of this overarching society. Ken Kesey wove a similar mirror image of society into his masterpiece, One Flew Over the Cuckoo’s Nest which tells the story of Randall McMurphy, a boisterous, brawling, fun-loving rebel and a fighter who swaggers into theworld of a mental hospital, takes over and incites rebellion in the other patients around him by challenging the dictatorship of Nurse Ratched, who rules her ward in a tyrannical fashion. He promotes gambling in the ward, smuggles in wine and women, openly defies the rules at every turn and challenges the notions of what is right and wrong. In the book, Nurse Ratched becomes a metaphor for the entire mental institution,the government, society at large—or to put it simply: any and every powerful institution that exists to regulate, control, oppress and categorize groups of people. The title of this classic is inspired from a nursery rhyme and metaphorically a cuckoo’s nest denotes a system of ruthless competition and tyranny of an outcaste. (A Cuckoo lays her eggs in other’s nest and her children, once born throw the other eggs away). Thus ‘One Flew Over the Cuckoo’s Nest’ means somebody who challenges the oppressive, competitive, and the ruthless system. After reading this book, I lay awake for hours- staring at ceiling, letting the intensity of the novel to sink in. A half-century after its publication, the novel still packs a punch- every page, every word, every theme it embodies is relevant today more than ever because the oppressive forces it mutinied against have only gotten more immersive and influential in our lives since McMurphy got zapped. The ‘Combine’, the novel’s metaphor for the silent machinery of social indoctrination, manipulation, and management, today has more power than ever before and we have silently accepted its tyranny, its power. In today’s world we are constantly labelling, judging and categorizing people. Through characters in the psych ward, Kesey makes a deliberate point of challenging the reader to ask themselves where the boundaries of sanity are, and who exactly determines them, and what is a world that allows the strong to label the weak or misfit as crazy just to shut them away- Yes, there are people all around who are undeniably damaged or hurting, but are they insane or do they just not fit perfectly well in a rigid society? The novel speaks of how social pressure and shame are used as weapons to control and manipulate people. Through its characters the novel makes it clear that many of the patients areholding themselves back from living freely because they are terrified of how they will be received by the general population for their behaviours. It reeks of today’s society where not fitting in because of sexual orientation, ethnic background, infantilization, language, dressing style, —no matter what, people fear what makes them different and would rather hide from society than face its judgment of them. The judgments are decided by the few in positions of institutional power, but their influence and legitimacy gives their views—however wrong or right—the ability to become the definition of what is acceptable in society. Think about all such institutions surrounding you- Khap Panchayats, government, family and peers. In addition to McMurphy, one of the prime examples of society’s tendency to reject anyone different than the majority is the patient Harding, who speaks with McMurphy in secret and implies his struggle with homosexuality. Fifty years since, society is still struggling with accepting homosexuality into mainstream thought, exemplified by the conflicts over gay rights. 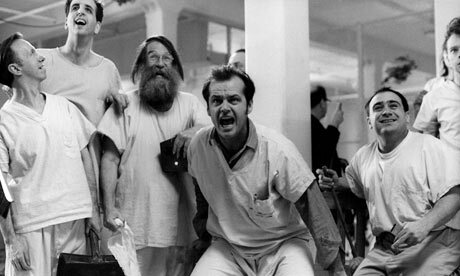 One Flew Over the Cuckoo’s Nest talks about the dehumanization, the mechanization of society. Through the character of Dr. Spivey, who despite disapproving of Nurse’s Tyranny and her inhumane methods, is not ready to speak up against her, Kesey mocks and ridicules the typical bystander masses who despite having ‘good intentions’, don’t have the courage to take a stand. The metaphors, symbolism and the relevance of the book can go and on. But conclusively, all I can say is that One Flew Over the Cuckoo’s Nest is a cautionary allegory of what happens when too much power is ceded to the institutions, when individuality and uniqueness is not celebrated. Today, when somebody like Arvind Kejriwal, a national hero, suddenly becomes an “anarchist”, “an insane man” because what he is doing is termed as ‘unconstitutional’ and ‘out of system’ (even if it is the right thing to do), this is a book which will move you and make you think and challenge yourself. By creating McMurphy, Ken Kesey has not created a character, but he has ingeniously managed to create an idea, an untamed figment and a revolution. This book is ‘A roar of protest against the middlebrow society’s rules and the rulers who enforce them’ and that is precisely why you must read it. ← And that day, I too became corrupt!